From Eugene take Highway 99 north to Highway 36. Travel west on Highway 36 approximately 38 miles to Nelson Mountain Road. Alternately, travel north from Mapleton on Highway 36. The Nelson Mountain Road turnoff is located near milepost 17. Turn south on Nelson Mountain Road to the bridge. 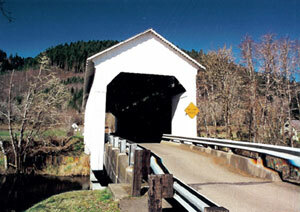 The Lake Creek Bridge, or Nelson Creek Bridge as some call it, was built in 1928 for the modest price of $3,155. The single-piece chords measure 14" x 14" x 111 feet for lower timbers and 12" x 12" x 79 feet for the upper chords. During the summer of 1984, the Lake Creek structure received a major overhaul. After adding a new center pier, contractors replaced the wooden flooring with pre-cast concrete slab decking. Because the concrete flooring and center pier do not support the trusses, the intricate job of installing them required use of a crane to slide them into place. Wooden abutments and wooden trestle approaches were also replaced with reinforced concrete materials. Portal boards on both ends were replaced in the late 1970s after they had been broken by the high loads of log trucks. A new coat of white paint was added to the structure after the reconstruction project was completed.